On the morning of Lily's twenty-fifth birthday, it's time to open the very last letter written to her by her beloved mother, who died when she was eight. Learning more about the first and only real love of her mum's life is a revelation. On the same day, Lily also meets Eddie Tessler, a man fleeing fame who just might have the ability to change her world in unimaginable ways. But her childhood friend Dan has his own reasons for not wanting Lily to get too carried away by Eddie's attentions. 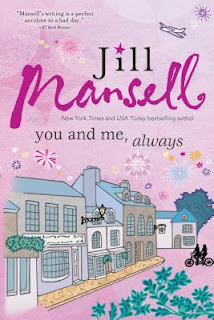 I always enjoy a novel by Jill Mansell. Sometimes though, they hit harder for me than others and this one was little on the lighter side. Mansell never fails to write characters with warmth and humanity though. I haven't come across a book of hers where I didn't instantly feel a connection with the people and the setting. She has a knack for making her protagonists feel like friends. You and Me, Always had a plot centered around one young woman, Lily, who has spent most of her life being raised by both the literal and proverbial village as her mother passed away when she was young. Their bond is explored through letters she left for her daughter, to be opened on each birthday, and this is the last letter to be opened. I loved the connection made between parent and child just by a few letters. I wish though that the connection had been brought into the novel a bit more. Instead though we were treated to her relationships with the surrogate family who raised her and their bonds were wonderful, honestly portrayed with their obvious compassion for her. Jill Mansell gave us two romantic interests in this novel and while both were plausible I was definitely rooting for one over the other! I would suggest though that the bonds between Lily and her friends were less interesting than they could have been. I found that Lily’s story was centered mostly around her growing up and moving on from her mother’s letters and finding someone to share her life with, as well as solidifying her surrogate parental bonds rather than focussing on her female friendships. Regardless though the story was good and exactly what I would expect from Mansell. Thank you to Sourcebooks for our review copy. All opinions are our own.